Sunrise behind the old town of Tallinn with the tower of St. Olaf's Church in the middle below fast moving colorful clouds seen from the Upper Town (Toompea). 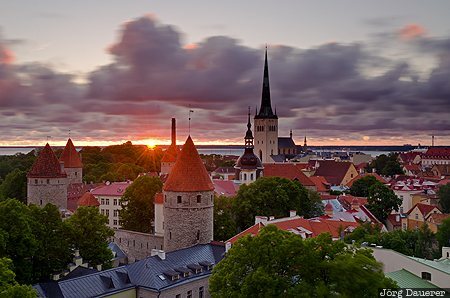 Tallinn (formerly called Reval) is the capital of the Baltic state Estonia. This photo was taken in the morning of a cloudy day in June of 2014. This photo is part of the exhibition Moving Clouds (February 2016). This photo was taken with a digital camera.